My favorite cookie is a soft and chewy Monster Cookie! It’s filled with peanut butter, chocolate, M&M’s, really anything you want to throw in there! I remember I had my first exposure to this beast of a cookie back in middle school and high school. Our middle school and high school were in the same building before they did a large expansion to build a connected middle school. During study hall and after school, you could purchase snack items at our little canteen. It was run by the lunch ladies and one of their top sellers was their amazing cookies. 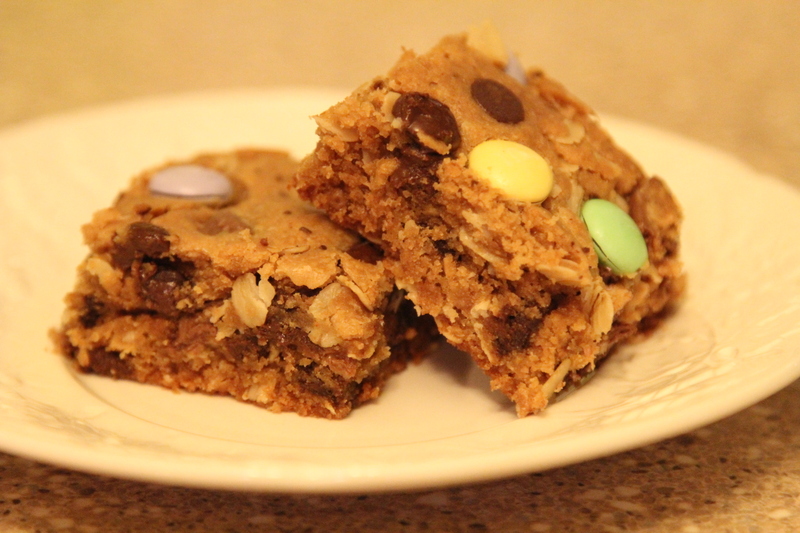 They had sugar, chocolate chip, peanut butter, oatmeal, and my favorite – the Monster cookie. And they were really cheap too. Sometimes, you’d stroll up just as they were getting out of the oven. 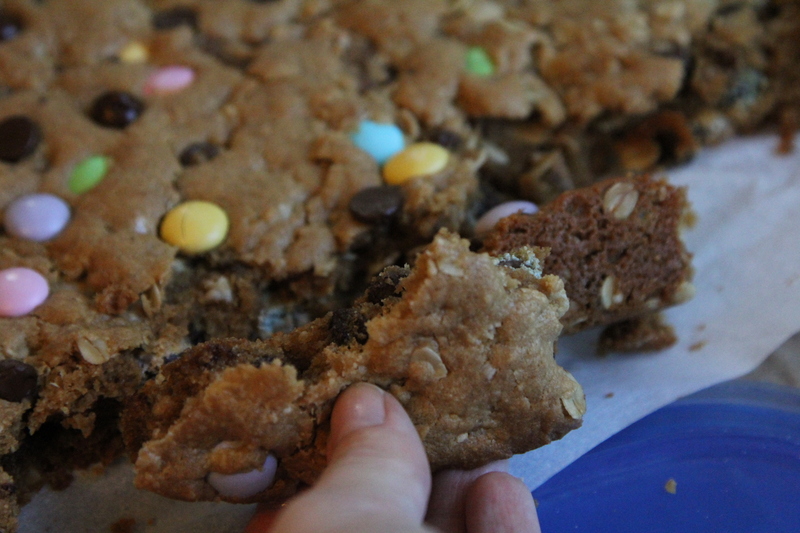 Nothing better than a giant warm Monster Cookie fresh from the oven, made by a sweet lunch lady. I can still hear the way one lunch lady said your total as she rang you up. I can hear how she said “Seventy” in my mind. I can’t describe it, but if you remember her, you probably know what I’m talking about. I think with my two cookie and one chocolate milk purchase, it came to “Seventy” cents because it just sticks in my mind. Or maybe that was the price of the Slush Puppy. This was another top seller at the canteen. They were a frozen slushy drink made with ice and fruit flavored full of sugar syrup. You could mix your flavors up and have the ladies make you your special combination. Lots of Slush Puppy brain freezes and happened in that cafeteria. I don’t think a lot of studying was done during those study halls, I was too excited for the snacks. I tend to keep a lot of baking supplies in the house. 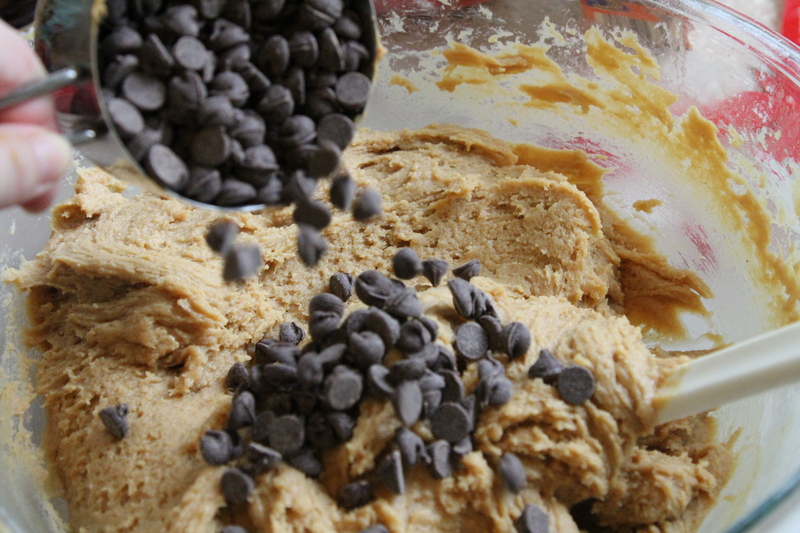 This includes a good amount of chocolate chips and chocolate. Well, the “good stuff” chocolate is put up high out of my girls’ reach. They know where it is and don’t dare get into it, or they know they will be in big trouble. I can’t seem to remember many things, but my brain can manage to keep a pretty accurate tally of how many Ghiradelli squares and Lindor Lindt truffles I have in there. When I buy bags of candy for Halloween, Easter, and Christmas, I stash all the leftovers and extra bags in a hiding spot in the pantry. I hope they don’t read this and start rummaging through the pantry trying to find it. Sometimes, that candy needs to be used up before it goes bad so that’s where this recipe comes into play. It’s a great way to use up some of that leftover chocolate candy and if you want it out of your house, you can wrap it up and give it away as gifts. Or if you have that craving for something really good, make a batch and enjoy a square or two or five of these goodies. 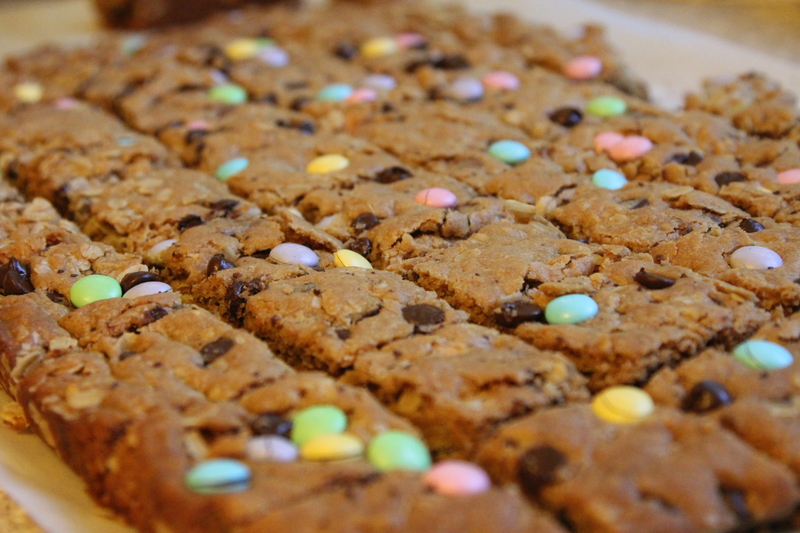 Notice the pastel leftover Easter M&M’s in my bars. I think I still have some leftover mini candy bars in the pantry from Halloween so maybe I’ll make another batch of these over the weekend. I forgot to include my oats in the picture. I used Old Fashioned Oats. 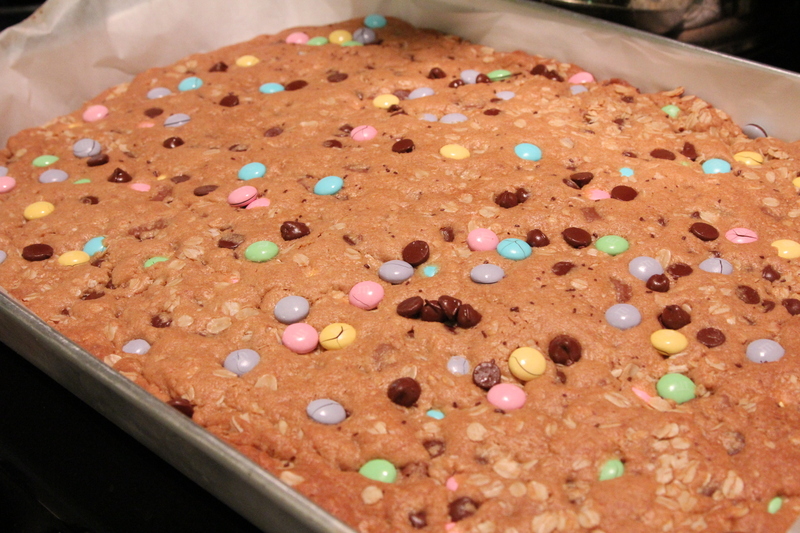 First you make a basic Monster Cookie batter and then add in whatever goodies you like. You can’t really mess it up. 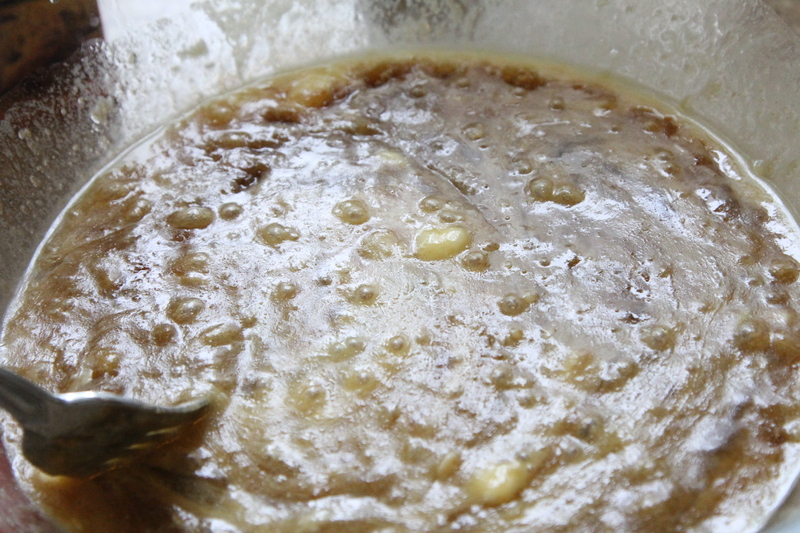 Begin with the melted butter and wet ingredients. Now incorporate the dry ingredients. Now you can add in all your goodies. 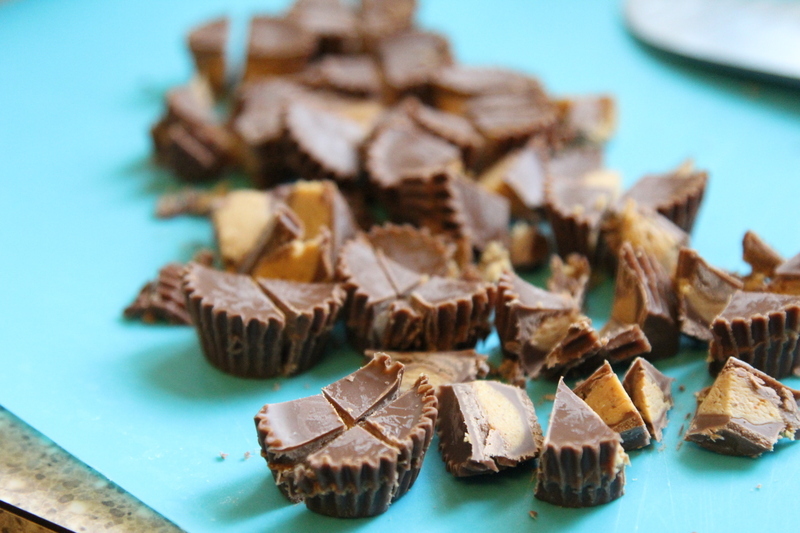 How can you go wrong with adding some mini peanut butter cups? 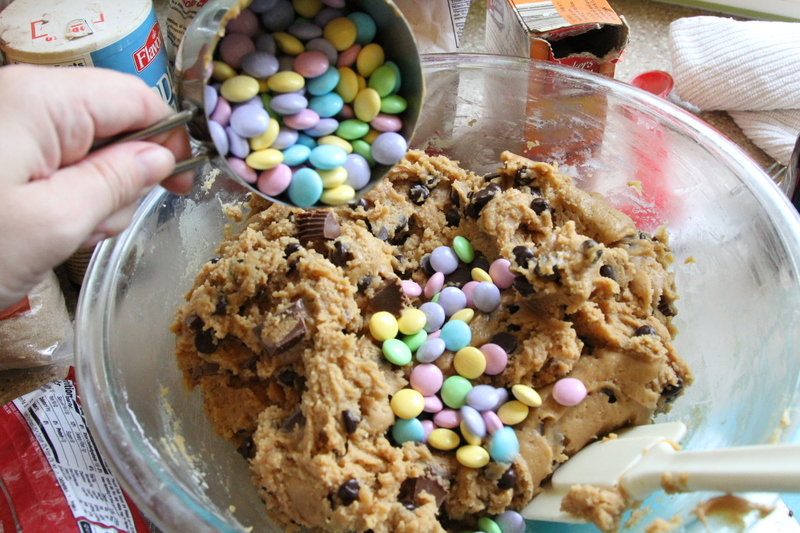 And M&M’s. Be sure to save some goodies to sprinkle and press on the top. I reccomend lining your pan with parchment paper so it’s easy to lift out and cut the bars. I used a 12 x 18 inch pan so this made over 2 dozen bars. Let it cool in the pan and then lift out and cool before cutting. I was impatient and cut a little early because I could not wait any longer! If it’s still warm, it may crumble a little. I would just cut those edges off and do a taste test to make sure it’s safe to eat. I do prefer these warm, so you can easily stick them in the microwave for a few seconds before enjoying. 1 1/2 C creamy peanut butter. 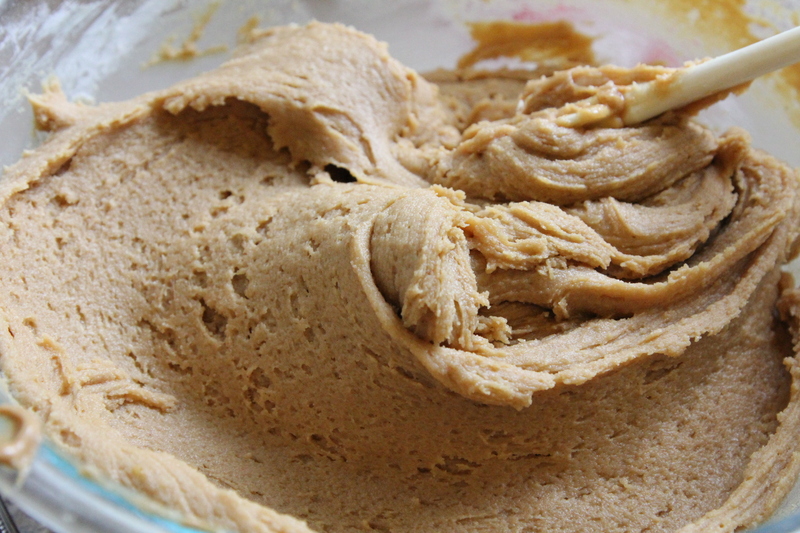 Do not use natural type peanut butter because it will be too runny. 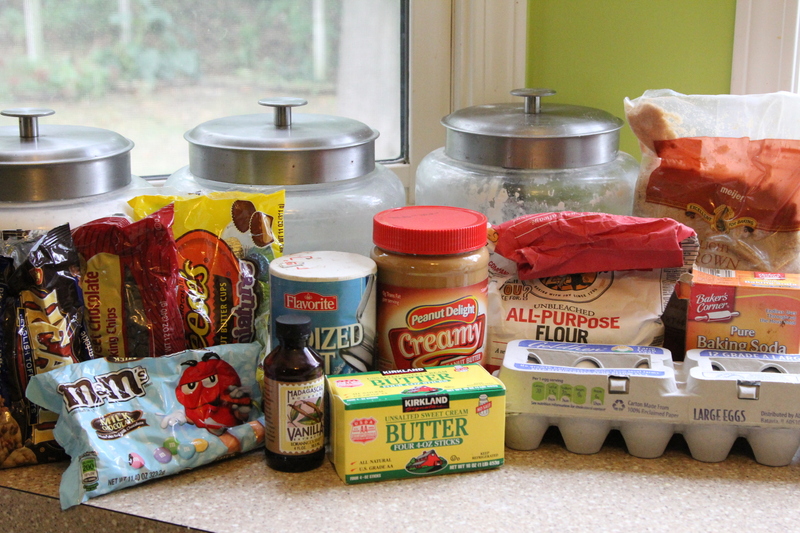 1-2 C chocolate candy chopped such as peanut butter cups, candy bars, toffee bits etc. 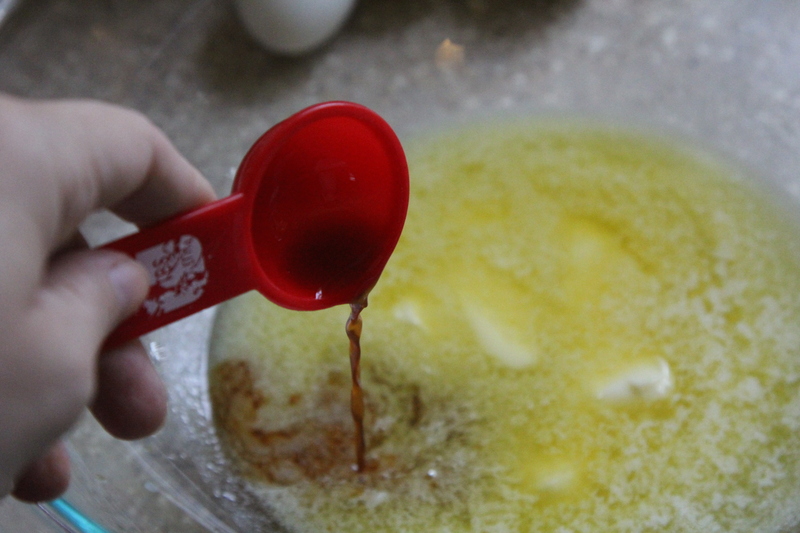 In a large bowl, combine the wet ingredients including melted butter, eggs, brown sugar, vanilla, and peanut butter. 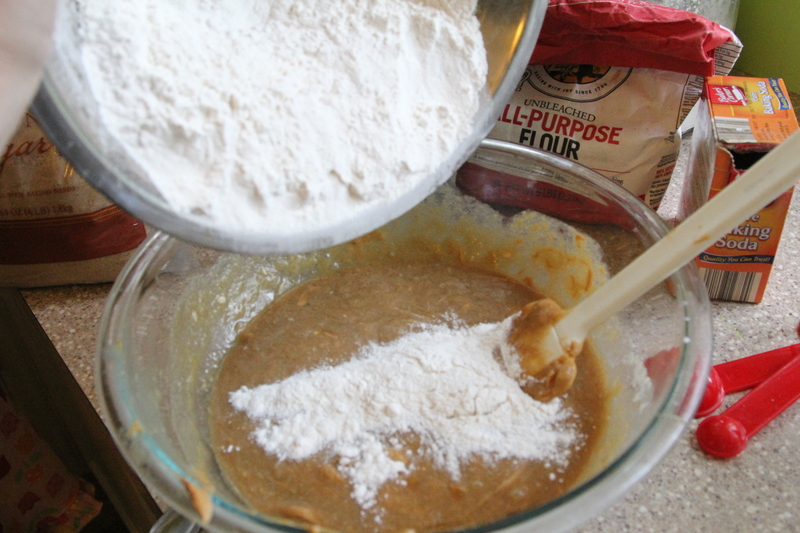 In a separate bowl, combine the flour, baking soda, and salt. 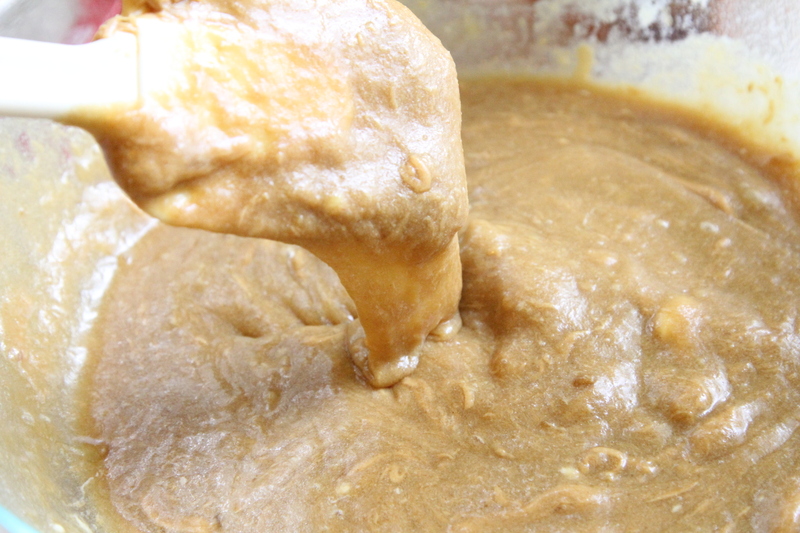 Slowly incorporate the dry mixture into the wet mixture and combine. 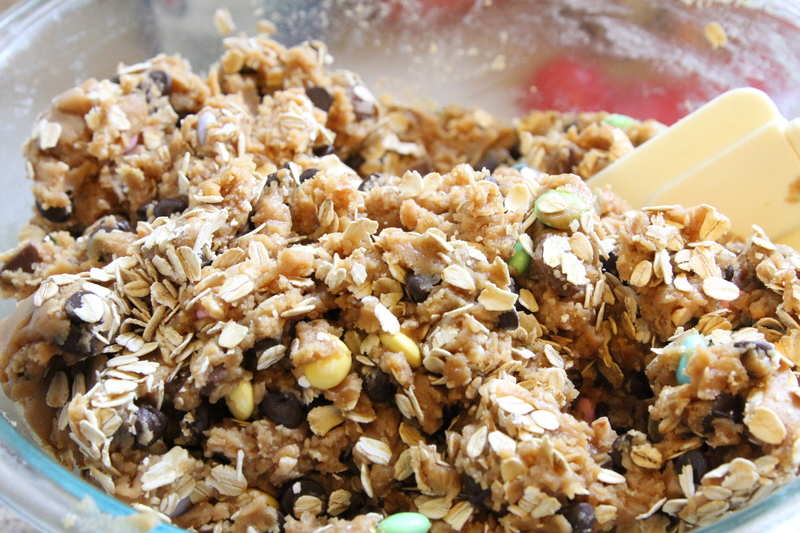 Add in the Oats, M&M’s, and chocolate chips (reserving some chocolate chips and M&M’s for the top). Line 12 x 18 inch pan with parchment paper all over bottom and up the sides. Have some paper hanging over the sides so you can easily lift the paper out of pan once bars are done. Bake in 350° preheated oven for 20-25 minutes until golden brown. It may take longer if using a smaller pan and your bars are thicker. 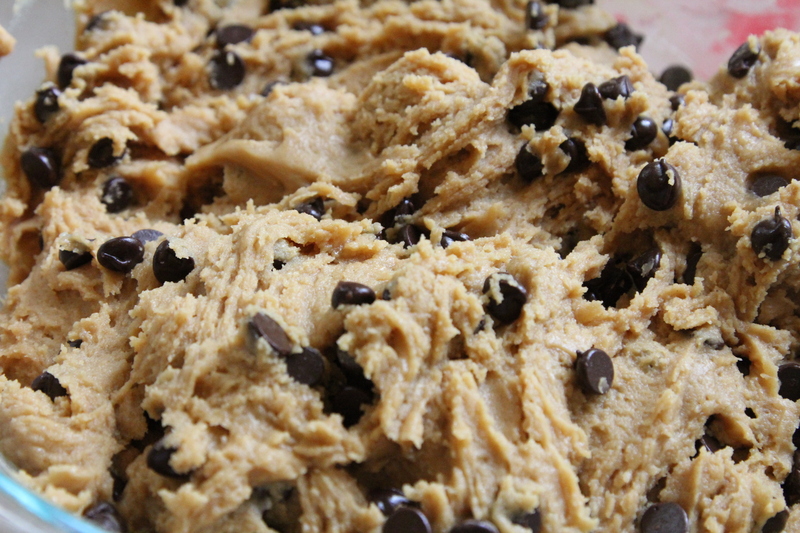 Once bars are golden brown, remove from oven and let cool. After cooling for 20 minutes, lift the bars out by grabbing the parchment paper. Set the bars still in the paper on a cooling rack and let them cool completely before cutting. 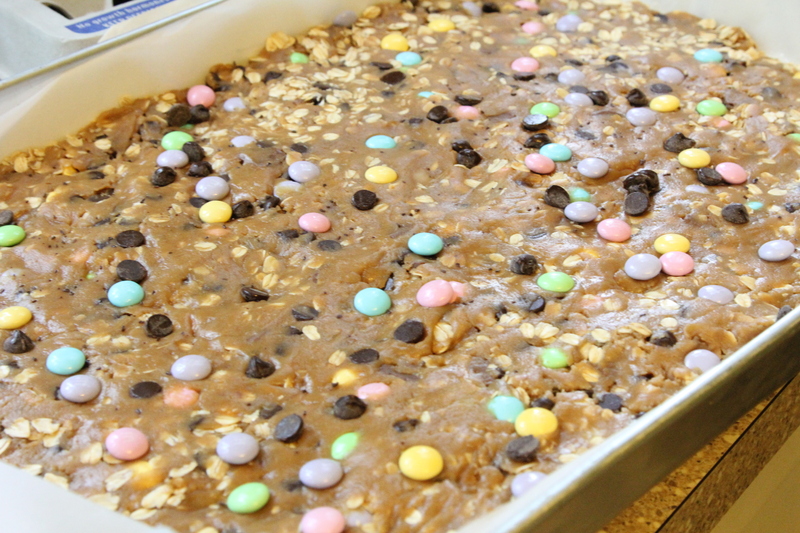 Once cool, cut into bars and dive right in! Store in sealed container. I layer them with parchment paper. Brussels Sprouts coming out my ears!